New London is a special place. In 1943, my great grandparents purchased a house one block from the beach in New London, Connecticut. At the time, it was a summer getaway from West Hartford. Over the years, the beach house has become a hang out for my whole extended family – grandparents, great aunts and uncles, first and second cousins, first and second cousins once removed, and a revolving cast of friends. It’s the same brisket-eating crowd I talked about earlier. Even though my immediate family only went to New London once or twice a summer, I have collected a trove of memories I will always cherish. I remember going to the GAM, an arcade just off the boardwalk, where tickets received for playing games could be traded in for exciting prizes. Skee ball and Whac-A-Mole were my favorites until I became strategic about getting the biggest bang (tickets) for my buck (my parents’ buck). The Cyclone was the answer to my dreams. A simple game, it entailed tracking a moving light around the perimeter of the cyclone and pressing a giant buzzer when the light hovered over a high point value. Press at the right time, and ribbons of tickets would come streaming out of the machine. Back at the house, we carefully counted our tickets, folded them like accordions, and saved them up in old cedar cigar boxes until we could afford the best prizes. I remember playing miniature golf with anyone that was tall enough to see over the counter where you had to pay to enter. For the first ten years of my life, I admit to being quite a cheater. Losing was not an option. I remember pushing the golf ball under the lighthouse feature on hole 2 and using my tiny golf club to place the ball right into the mouth of the big whale at hole 17. The course was dilapidated even then, its run down feeling always a central part of its charm. Most of all, I remember the rocks. Our beach has 4 sandy sections, each separated from the next by a jetty of rocks. My cousins and I spent all day every day on the rocks, pulling mussels off the walls to attract and catch tiny crabs, popping the air bubbles in seaweed, and lounging in the warm tidal pools. Every once and a while, my uncle took us fishing. I remember driving into town to buy worms, learning how to bait the fishing hooks, and casting the rod (with help) far out in to the ocean. It was such a thrill to catch even the smallest fish, take a picture, and throw it back in. We never caught sea bass, but I wish they swam in the Long Island Sound so that we could have made the recipe shown here. I remember so much more – Michael’s ice cream, hor d’oeuvres on the front porch, the outdoor shower, Fred’s Shanty (or Fr’shanties), swimming out to the raft, burying jellyfish on the first beach, making mud pies on the second beach, taking our bikes on the ferry to Block Island – but I will save these for other posts. New London will always have a special place in my heart, and I look forward to many more years of memories at the beach house. This is a recipe where anything goes. Described here are the approximate quantities I used, but feel free to change them depending on what you have in the fridge. 1. To marinate the fish, mix soy sauce, a handful of cilantro, and juice from 1 lime in a flat dish or zip lock bag. 2. Salt and pepper both sides of each sea bass fillet. Add fish to marinating liquid. 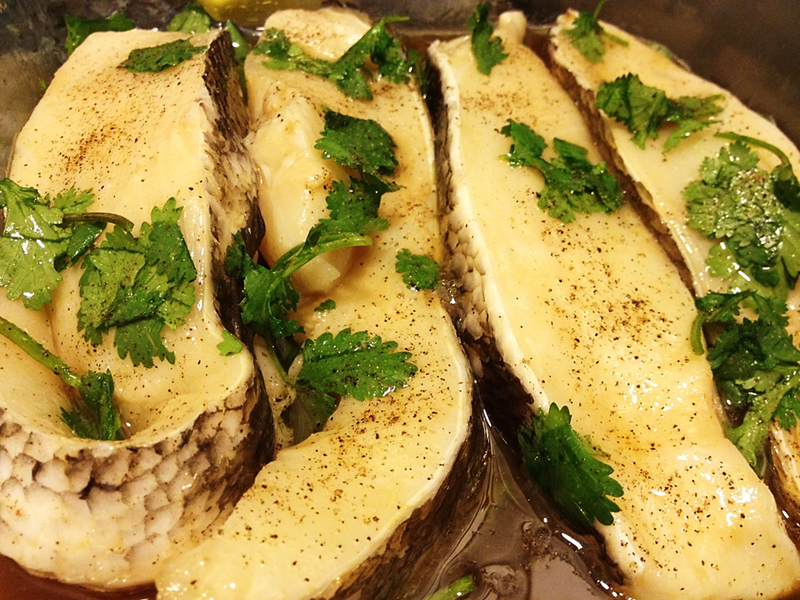 Turn fish fillets to coat in marinade and cilantro. Marinate for 1-3 hours or more, depending on how much time you have. 3. 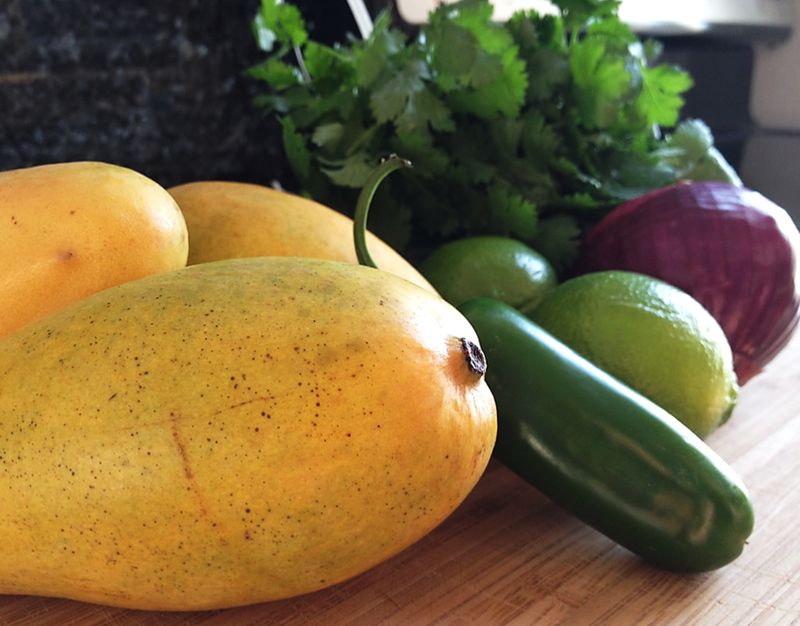 Chop mango, cucumber, jalapeno, and onion. Mix together with remaining lime juice, cumin, and salt and pepper to taste. 4. Grill sea bass for 3-4 minutes on each side or bake for 8-10 minutes in a very hot oven (~500 degrees). 5. 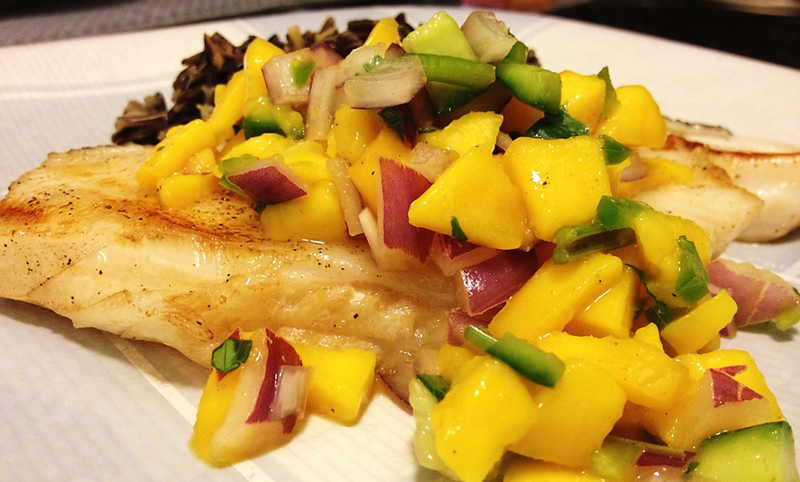 Plate fish and salsa – enjoy!